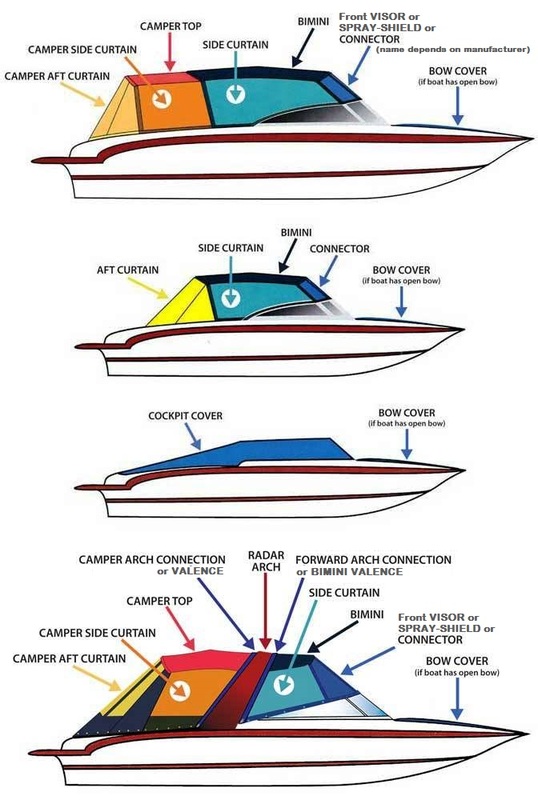 RNR-Marine™ developed the patent-pending Flats-Top™ to provide "Shade for Flats Boats"™. 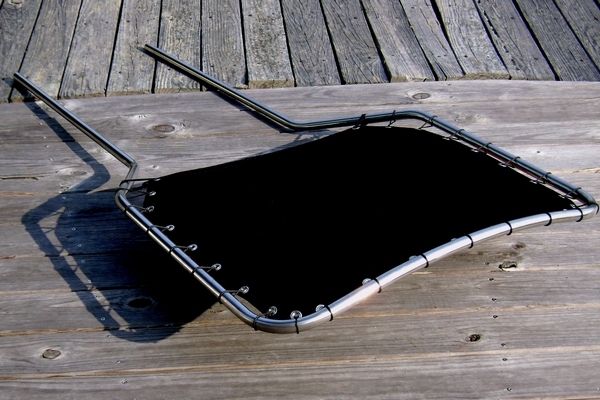 Currently, there are no top solutions for flats boats which can be used at speed and removed easily when not needed (beach umbrellas are often used, but must be taken down for the ride). Our goal was to provide enough shade for two people, while providing clearance for fishing and poling. 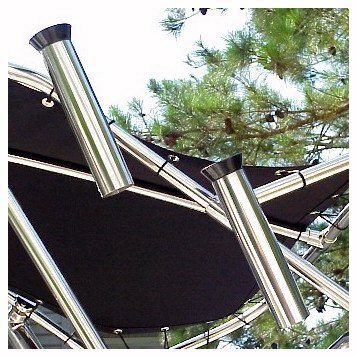 We have applied for 3 US Patents and began producing the rigid Poling Platform Mounted Flats-Top™ in July 2010. We have various sizes and lengths (see specification below) to fit all Poling Platforms. 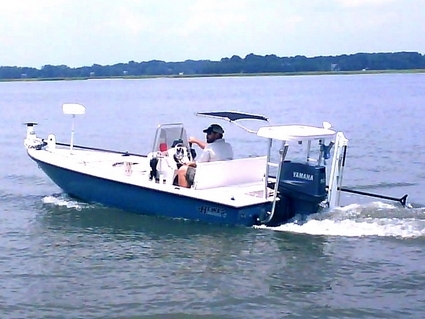 We installed the first Flats-Top™ (Long, Medium-height model) on a client's 2005 Hewes Redfisher 16 in 2010. It looks cool and our client (and his girlfriend) love it (and the shade)! This client is a real "gadget guy", but had never found a suitable shade solution. He was elated with the Flats-Top™ and anxious to share his story in pictures. The install takes about 1.5 hours with simple tools. We immediately took the boat out for a test ride and the top was very stable, as you'll see in the YouTube video below. The boat trailers fine with the top in place and our engineering calculations show it to be safe (from bend failure) at well above 70mph, so we're comfortable with warranting the top at highway speeds. 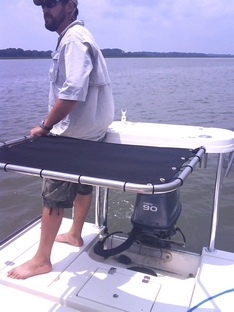 Stand up to sight for fish and use the Flats-Top to lean on while fishing! the ability to stand on the rear deck and lean against the top for support (when you have some waves for example). Use the Flats-Top™ at speed! We, and our many customers, have used and tested the Flats-Top™ on the water and on the highway since 2010. Your beach umbrella can't do this! All RNR-Marine™ stainless steel tops are manufactured in North Carolina, and are backed by an industry-leading 10-Year Warranty! 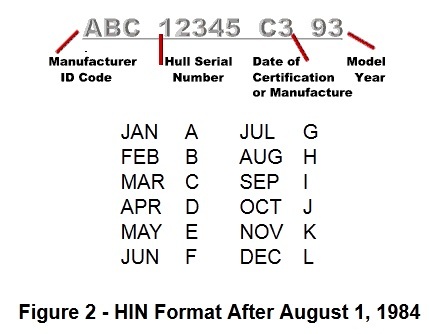 No other Top manufacturer offers a 10-Year Warranty. The Flats-Top™ provides shade for flats boat, usable at speed (up to 65mph), and easily removable for fly fishing on cooler days. It installs in about an hour, and provides refreshing, cancer-avoiding shade for 2 people seated at the boat's console. 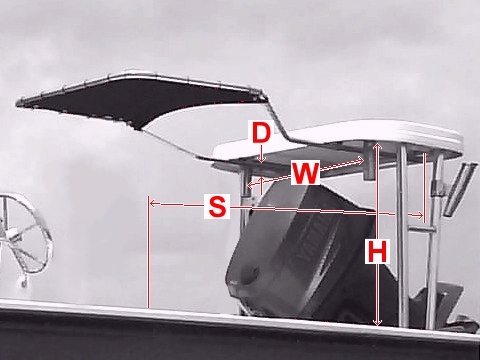 Models: Three heights (Low, Medium & Tall) in two lengths (Short & Long) are designed to provide 41-45" clearance directly above the front of the helm bench seat. Frame: Ercolina® Numerically Controlled (NC) bent AISI type 316L polished surgical stainless steel tubing assembled to type 316 stainless screws and fittings. Canvas: Black or Mediterranean Blue Tweed Sunbrella® 9.25-oz. acrylic marine canvas with color-matched Nylon webbing sewn around the perimeter and nickel plated grommets. Supplied with black braided Nylon Lacing Cord. Sunbrella® has an Ultraviolet Protection Factor (UPF) of over 50 (considered the ultimate in UV sun protection) and has received the Skin Cancer Foundation's Seal of Recommendation. Shade: 30"L x 36"W = 7.5 sq.ft coverage. Height: 41-45" clearance above helm seat cushion (people are 34-39" seated). allowing the captain to stand at the helm to look for fish. Speed: Rated to 65mph when properly mounted. Assembly: Lace canvas (20-30 mins). Installation: Measure, drill and mount (45-60 mins). 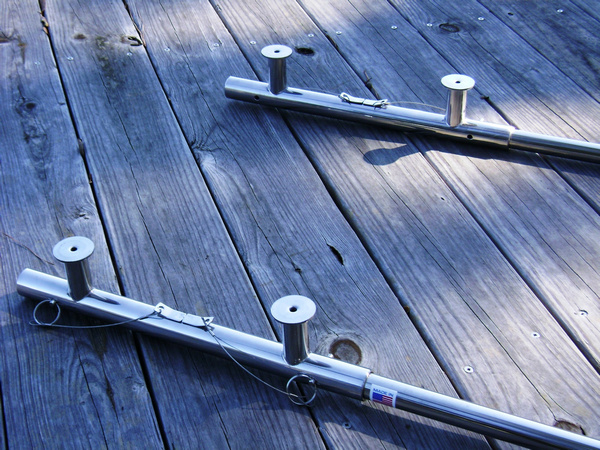 We recommend a SeaDek® Poling Platform Pad to cover the top of the poling platform after installation. Its easy on the feet! Maintenance & Cleaning: Routine Inspections, Scheduled Maintenance and Cleaning. Warranty: Industry leading (no other Top has more than a 3 or 5 year warranty) 10-year frame waranty and Sunbrella® fabric warranty! 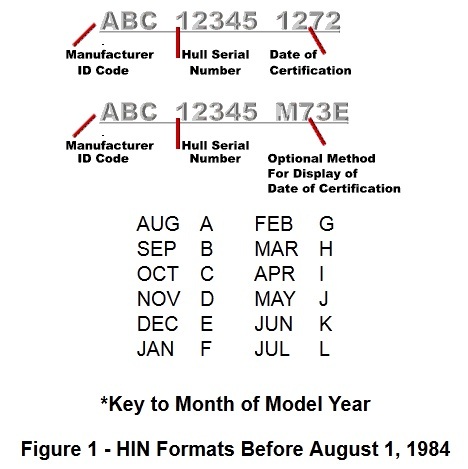 Shown at left on a 2004 Hell's Bay® Guide 18. Both photos shows the old (2010/2011) mounts, and the "flat" frame. For 2012, we have much nicer mounts, as well as a curved front, as per above. 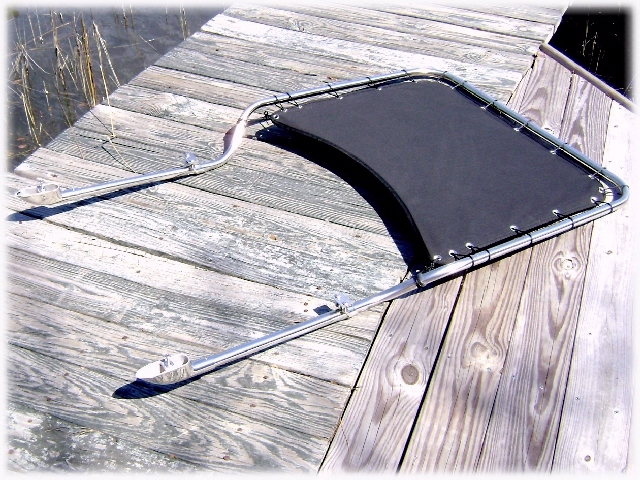 2010: RNR-Marine™ developed a Poling-Platform Mounted Flats-Top™ design in a combination of heights and lengths to fit most flats boats poling platforms. We began producing this Flats-Top™ in July 2010. 2012: We are gathering data and working on a stable, universal design Console Mounted Top for 2012 that will mount/dismount easily to many small consoles. Rated 9/10 based on 12 customer reviews. and backed by the industry leading RNR-Marine™ 10-year frame warranty. 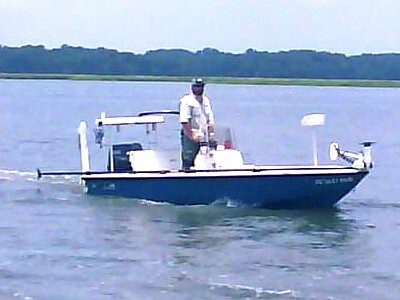 Flats-Top™ at Speed ... Hewes® Redfisher™ 17 with Flats-Top™ on the water!